Safely and effectively control the flow of CO2 to 2 kegs in your draft beer system with this Micro Matic 8022 double gauge regulator! If adjusting the pressure on the primary regulator that's attached to your CO2 tank is problematic, this secondary regulator connects to the primary unit via a gas hose so you can mount it in a more convenient location and control the gas flow from there. 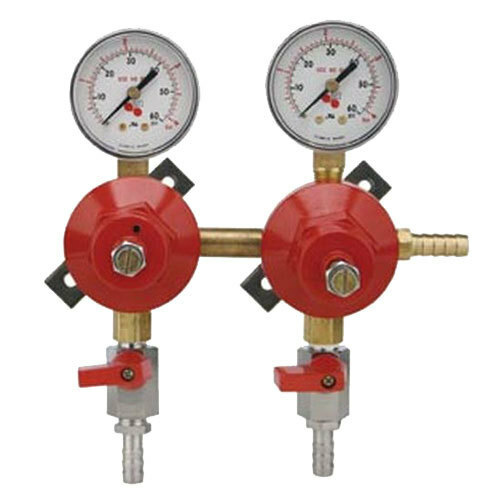 This secondary regulator from the affordable Economy series comes with 2 gauges with a 0-60 PSI range so you can quickly monitor the varying amount of CO2 flowing from your gas tank to each of your unique kegs. Regulating CO2 is key in providing guests with quality draft beer because if the pressure's too low, your beer may taste flat and if it's too high, the beer may pour with excessive foam. The pressure on this forged brass regulator is easily adjusted by turning the set screw with a flathead screwdriver. It features (2) 3/8" outlets with a shut-off valve so you can quickly and easily stop gas flow and, for added safety and peace of mind, this model has an integrated pressure relief valve that stops the gas flow if pressure gets too high (at 55-65 PSI).